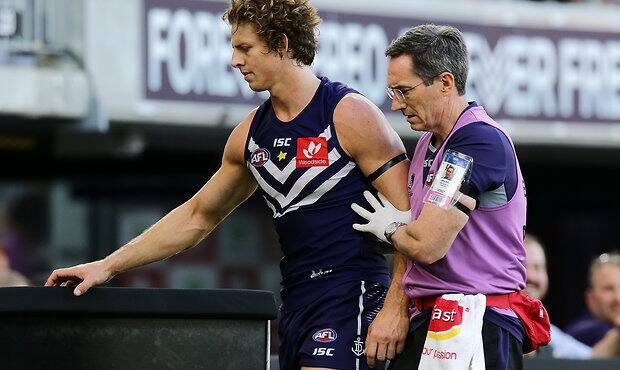 FREMANTLE coach Ross Lyon has declared Nat Fyfe a certain starter for the Dockers’ trip to face the Giants, but key defender Joel Hamling remains in doubt after his own concussion battle. Meanwhile, Lyon hoped injury-plagued Harley Bennell would be back playing within two weeks despite another calf scare on Tuesday. Fyfe has passed his cognitive state test after suffering a nasty concussion against St Kilda in round three and will be on the plane to Canberra after training strongly on Tuesday. “(He is) really vibrant, in a sense freshened, so we’re quite excited by his return,” Lyon told Channel Seven. But Hamling, who was ruled out of the Western Derby defeat in the second quarter, has hurdles to clear before a potential battle with Coleman Medal leader Jeremy Cameron. “He was still a little bit symptomatic yesterday, so he hasn’t undergone his cog state yet,” Lyon said. “Hopefully he gets symptom-free next training session on Thursday and if he passes his cog state he’ll be free to play. Lyon expected veteran small forward Hayden Ballantyne to be available after going down with a hamstring injury in round one, and the Dockers are set for more positive injury news in coming weeks. Strong-bodied midfielder Connor Blakely should return to football next weekend after a serious hamstring problem sustained in January, while young defender Griffin Logue is also one week from resuming after repeat hamstring woes. Bennell, who hasn’t played at any level since last August, sent another scare through the Freo camp due to “calf awareness” during training on Tuesday. The former Sun was sent for an ultrasound, which came back clear, and will have an MRI scan on Wednesday morning. Bennell had only recently returned to some training with the main group after his last calf dramas in February. “He was training today. He’s maybe hyper-aware, tightened up a little bit, so we sent him for a precautionary scan, that came back with no abnormalities, but we’ll see how it is tomorrow,” Lyon said. The Dockers still don’t have timeframes for Aaron Sandilands (calf) or Shane Kersten (foot) to return to football, while Stefan Giro (hamstring) and Hugh Dixon (plantaris tendon) are tests for Peel’s Good Friday clash with East Fremantle. Stephen Hill’s comeback date from long-term quad problems has been pushed back to six weeks and he is unlikely to be seen before the Dockers’ bye in round 12.